Only available on paper - carefully printed, extremely limited collectors edition (73). The book's physical specifications: 129mm x 198mm, pp.80 (i–x, 1–70), digital web printed on Munken Premium Cream 80gsm. Casebound with Wibalin Amethyst over 2500 mic boards. Tipped in colour portrait, loose gold ribbon marker. 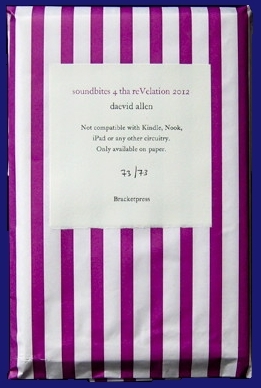 Letterpress printed Hahnemühle Bugra Butten 130gsm wrapper, presented in purple and white candystripe bag with edition plate on front. Hand numbered edition of 73 copies. 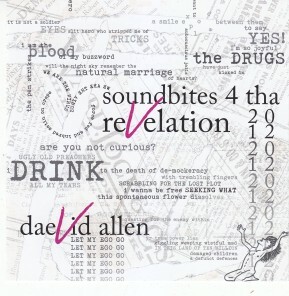 For more info about this album, including samples, see the Soundbites 4 tha reVelation micro-site. 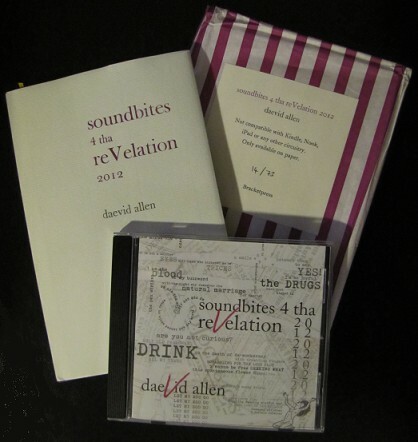 re-defines the nature of music, poetry and sound-art. Firmly anchored in the present, this album reaches into the future. through earlier projects such as with Soft Machine, collaborations with William S. Burroughs and Terry Riley. this album pushes the boundaries of convention in ways few have.